Are you driving a high performance vehicle and need to replace your clutch? If you want to maintain the quality of driving that you are accustomed to, you'll need a high performance clutch to replace the one that is worn out or starting to slip. 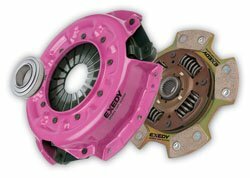 Performance clutches are specifically designed for the type of driving that street & strip, rally and motor sport vehicles require. This style of clutch goes by several names that include button clutches, puck clutches, sports clutches and racing clutches. So why are these clutches different to the clutches that are used in standard vehicles? How Do Button Clutches Work? These clutches work in a slightly different way to the clutch in a standard vehicle. The buttons (pucks) provide extra grip over standard clutches because the material that the buttons are made from, gives your high performance engine more applied torque and thus faster acceleration. In the image (right) you can see the 'buttons', which can vary between 4, 5 and 6 buttons (also known as pucks). Heavy Duty Clutch Kits- for amateur motor sports or modified vehicles or those used for towing (where the demand is greater than standard). These kits contain a high clamp load clutch cover and a ceramic button clutch disc with sprung dampers. Cushioned Button Clutches- have a spring loaded centre allowing a smoother transition when releasing the clutch, but still providing increased engine torque. Suitable for vehicles driven daily, the clutch kits contain a high performance clutch cover assembly and ceramic clutch disc. Button Clutch Kits- clutches which are designed to handle the hard road use of circuit, rally and drag racing. Clutch kits contain a high clamp load clutch cover assembly and ceramic button clutch disc with sprung dampers. If you have an queries about which high performance clutch kit is best suited to your vehicle, please ask us, we are clutch and transmission specialists with over 39 years experience in the motor industry in Australia. NOTE** - The choice of flywheel will also influence how your clutch performs. When replacing your clutch it is a good time to check the condition of the flywheel. If it needs replacing, you might consider changing to a lighter flywheel to improve performance.